Where Dominique and his troupe went after their performance at the Festival is not known. Possibly they took the last sailing for Britain just before the closing of the navigation season. Or they may have returned to the United States, traveling down the east coast to the warmer climes where many itinerant theatre troupes spent the winter months. The orchestral accompaniment for the Township Festival entertainment included all sorts of instruments played by local musicians. To find a variety of musical instruments in Quebec at this time is not unusual. When the French settlers immigrated to New France they brought with them their love of music, song, and dance, and primary among the musical instruments was the fiddle. 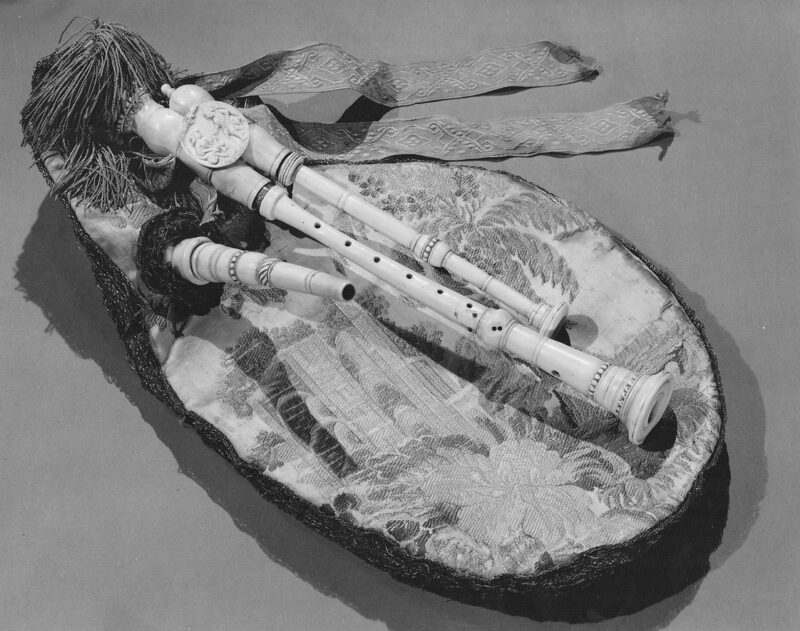 Among the instruments was a bagpipe or cornemuse which was native to central France, and which is still played today at Quebec Festivals. 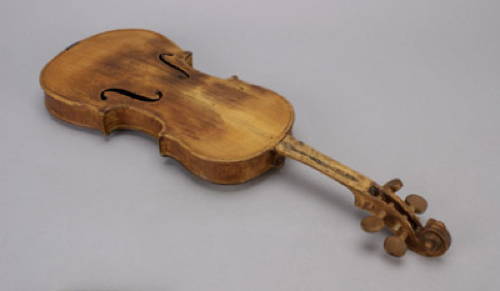 As well there was most likely more than one fiddle because of its important place in Quebec folk culture then and now. 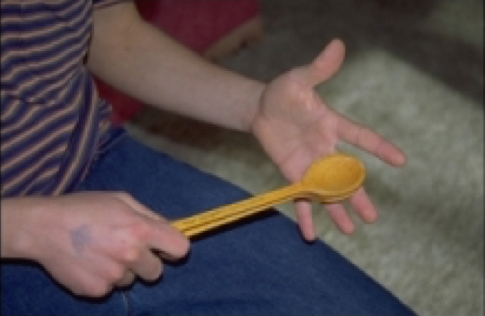 Two other traditional instruments that are part of Quebec’s musical history that may have been part of the orchestra were the spoons and Jew’s harp. 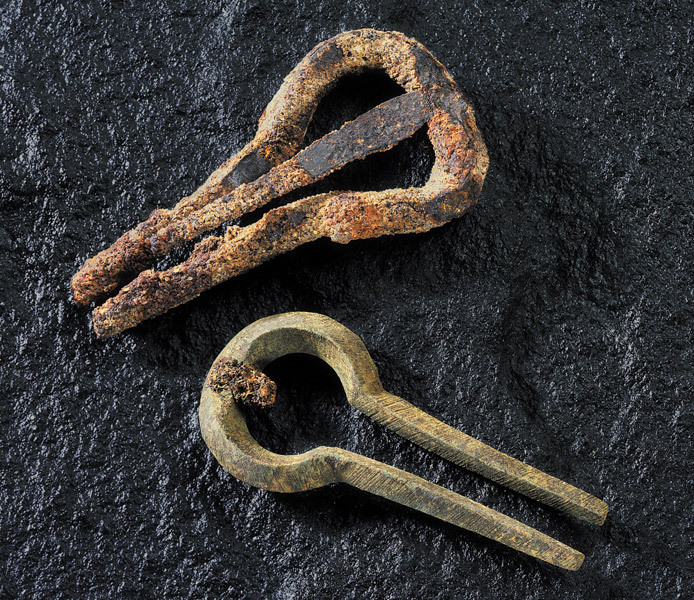 The latter is also known as a jaw-harp. Drums and recorders would also have been part of the orchestra. The evening’s entertainment concluded with a ballet of Shepherds and Shepherdesses. It is not clear from the advertisement in the Gazette who performed the ballet, but it is possible that the villagers themselves choreographed and danced the performance. In fact, their life experience provided them with the necessary skills to produce their own theatricals. They could sing, act, play musical instruments and dance, and although their histrionic talents may not have been on a par with Dominique’s troupe, their local theatricals were obviously a source of lively enjoyment. Using their traditional songs, music, and dances such as the gigue, or perhaps a folk branle (a dance performed in a circle), or a folk minuet, along with the addition of singing and pantomimic gestures the performance likely resembled a ballet-pantomime. Evidence supporting the idea that the colonists arranged and participated in such events is confirmed by the Jesuit Fathers in their Journal entries as early as 1640 and 1647 where they report a ballet at a wedding, and a ballet at the stores of Les Cents Associés. 9. Reuben Gold Thwaites, ed. 1899. The Jesuit Relations and Allied Documents 73 vols. Cleveland: Burrows. vol. 27:203. 10. ibid. vol. 30:159. It is not known why nine-year-old Marie Marsolet, the eldest daughter of Nicolas Marsolet, was in attendance at the performance. Minuet of Canadians Library & Archives, Canada Artist: E. George Heriot, c. 1807 Library and Archives Canada, Peter Winkworth Collection of Canadians. Dance with white fiddler accompanied by white and black tambourine/drum players. The Township villagers may not have performed with the finesse of professional entertainers but would have enthusiastically joined in the gaiety of the event, perhaps without the fear of repercussions from the Roman Catholic Church for at this time the Quebec colonists were living under the British. 11. 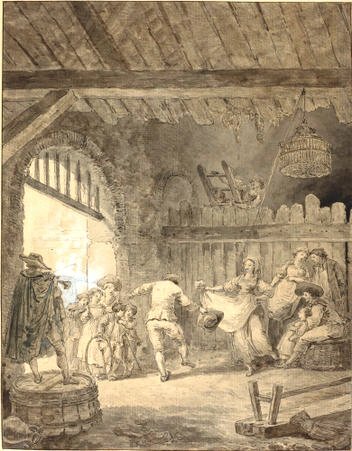 The negative attitude of the Church in New France toward dance and theatrical amusement was relentless and uncompromising. The Church considered secular dancing wicked because it gave into instinctive human nature, which suggested pagan ways and ideals of living. Hence, theater and dance, native or peasant, found little opportunity for development in New France. The struggle for free entertainment between the Church and the Quebec colonists would persist until the coming of the British in 1759. 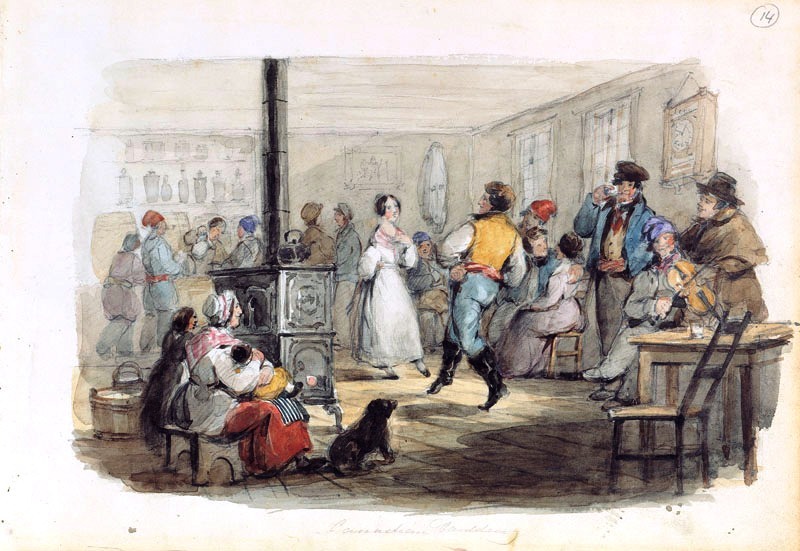 Sharing neither the ethnic or religious background of the French, the British had no misgivings about allowing theatrical events or social and theatrical dancing. 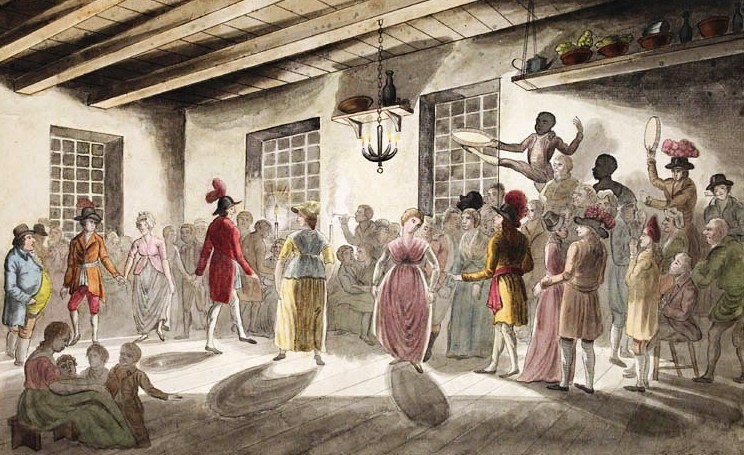 Five years after the British occupation of New France, the Quebec colony was enjoying professional theatrical performances that included pre-Romantic ballets and divertisements. The Festival in the Township was obviously meant to give pleasure and delight to all those who attended. It was an event where everybody could have a good time following the rigorous work of bringing in the harvest. One can only imagine the fun and excitement of all those that attended the closing grand ball. (It was perhaps their version of the events enjoyed by the Quebec Bourgeois). When the evening’s festivities came to an end and the villagers departed for their homes they would take with them many fond memories of the evening, memories that would be talked and laughed about during the cold Quebec winter months that were fast upon them for it was, after all the 18th of November 1765. 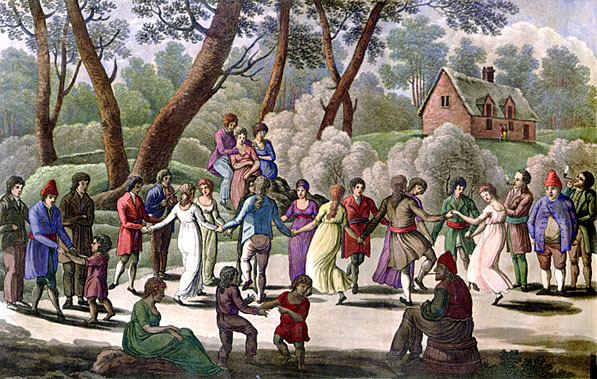 Pierre Guilmette, Dance in Canada during the Eighteenth Century. American Society for Theatre Research, Nov. 28, 1970. Paper (unpublished).